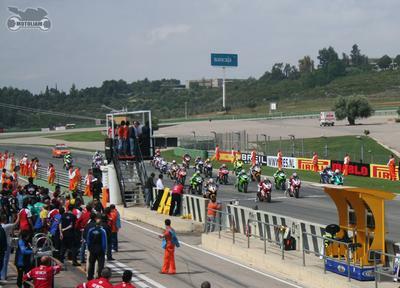 I made it to Valencia for the third round of WSBK, April 23rd, 2006. I wasn't sure I was going to make it, as a couple things had to fall in place to make this happen. Step one was renting a car and establishing a place to sleep. Pepecar made it possible to do both. 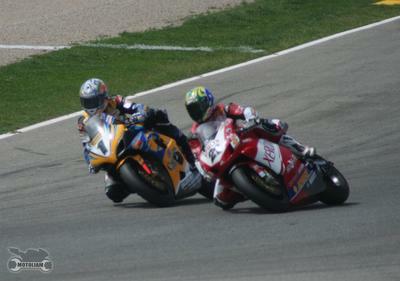 The racing was great and I had the opportunity to shake hands and meet some great people in the paddock. Full report with photos to follow, but for now I'm off to Albacete, where I'm to spend the next week helping Spanish/American rider, Kenny Noyes, with his Yamaha effort. See you guys in a week! Most of the racing action centered between the battle of the Troys. Reigning World Champion, Troy Corser, on the #1 Corona Alstare Suzuki, and former World Champ, Troy Bayliss, on the #21 Xerox Ducati.